thank you all for contributing to the raffle, here are the winners ! I want to thank you all for the 100.000 page views, and the 9000 watchers. If you don't follow the rules your comment will be hidden. I can not constantly ask people about stuff they forgot to mention because they didn't read. - You'll need to create a journal or a poll with a link to this journal. When you've done that let me know in the comments by linking your journal/poll in a comment below. I'll answer you with your entry number. - You must write in your comment if you are interested in art, premium, or both. I need to do this because don't want people to end up having a premium when they don't need it, or art when they don't own characters for example. Also please do note that if you unwatch me immediately after the raffle,and you win a prize, you will be disqualified and your price will be raffled again. Feel free to unwatch me after receiving the price but not before, otherwise It just wouldn't be fair to my other watchers. The winners will be chosen using random.org. When do you announce, if you don't mind my asking. If you do, then just ignore me. When yo'ull say the winners? I'm interested in both, but I don't have a character. I think my SO is drawing one for me. oh man why havent i seen your art yet its Beautiful! watched. Thank you for this wonderful opportunity~! Doing redlines for 5$ [PERMANENTLY OPEN]A redline is where i draw over one of your drawings/lines/sketches to show you how you could correct your anatomy/or help you get the pose you want. However, I am not perfect either so I will give you advice with my current anatomy knowledge. Deviantart banned me from premuim content(UNBANNEDWE DID IT WE DID IT ! That they were willing to lift my ban if i accepted the rules they listed for me. I hope LordMarlon will also get rid of her ban. Update 3: Deviantart replied to me some days ago, but i was too stressed to talk about it, sorry guys. They told me I did receive a warning, but i received it in 2013. After some thinking, I remembered indeed, that that was the first time i got the commission widget. test how the widget worked. According to DA that is supposed to be my warning for this. In 2015. They said I could contact them again about it in 4 weeks. I'm not sure what to do now, I feel extremely anxious and sad. and/or have arm,wrist or shoulder pains from drawing, or using the computer ,and ignore the pain. PLEASE read this or spread this journal, or share it with someone who does or has this. I re-posted this because I think it is extremely important people are always aware of this. and it has returned again. You might have heard of it and thought, meh. And maybe you already have it. or make some other people happy. and i chose the second option ^^ it's almost Christmas anyway ! I gave away a 3,200 worth of premium memberships. And i want to see what amazing designs you guys suggest ! are you feeling down yourself? 6000 Watcher Raffle! Winners announcedBefore I announce the winners! Please keep in mind to be kind and a good sport in the comments, complaints as well as rude or inappropriate comments will be hidden to keep this journal nice and orderly! I have delivered on all my prizes at this point! Enjoy, winners! Alright! Thank you everyone who entered in this raffle! A raffle which was made so much grander than I expected thanks to the donations of everyone that volunteered a prize! My thanks goes out to each and every one of you for kindly donating prizes as well as your time for this raffle, I hope in future raffles, I see as much of a turnout as I did this time! Now for the moment you're all waiting for! The winners! CONTEST - Draw my OCs! CLOSEDYeeeeeh Doing a contest ;v; 'cause I just feel like that 8D Going on it! Thank you so much to all for entering! Easy, draw any of my characters listed below in the way you want. Traditional, digital, pixels... whatever! You can do the amount of entries that you wish, but you can get just a prize! Submit your entry to dA and put a link to this journal. Then put your dev on a comment here, on this journal. That's all! By now the amount of points will be reduced but, after I finish my exams next week I'll try to gather some more for adding more prizes 8D By now! EDIT2: My gosh, we already have 70 participants! Go, go, go! Invite friends, tag them, because when we reach 100 we will add one more MYO slot to the winning places! EDIT: With Kamirah we decided that if there will be at least 100 contestants (we have 40 so far and there is still a lot of time til the end) we will add third MYO slot to the prizes! Okey! So let's start with the first event in group! This will probably interest more of you, specially those who do not own an Eyapi yet! It is time for Eyapi MYO common slots raffle! - THIS IS ONLY FOR NON-OWNERS! - You have to be a member of Eyapi group. - You need to make a journal or poll about this MYO raffle. So.. please read the rules and information about this contest first. 2500 Point Giveaway : CLOSEDSo I've had a bunch of points laying around for months now so why not have a giveaway? Make a journal promoting this giveaway that links back to this journal and post it down below. 1000 pts in prizes~! CLOSEDDHey there~! I am finally open for commissions and I wanted to put the word out so I'm throwing a minivent. YES! YOU CAN WIN BOTH IF YOU ENTER BOTH~! 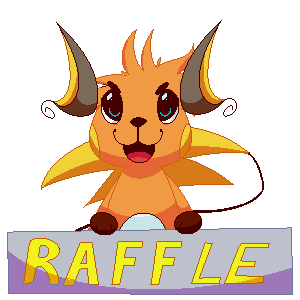 Whoever enters into the raffle will be all put into a randomizer and whoever's name pops up will be the winner~! 1) You need to post this commission page in a journal, featuring it. Winners will be announced momentarily! It is OKAY to comment on a ticket that has already been commented on!! That's how you get one extra ticket!!! So please, comment away on whatever tickets you find!! Don't be discouraged if you see someone found it before you! The only thing that can be claimed once is the ticket question, and that's only if it's answered correctly! Sorry for any misunderstandings! I just noticed tickets had multiple views, but were only getting one comment per. I hope this cleared the air! THE SCAVENGER TICKET HUNT HAS BEGUN! There will be questions on each ticket. The first person to successfully answer each question will receive bonus tickets!! These tickets will either be in plain sight, or very sneakily hidden! For those who want to know what they're looking for, they look like this! As I promised, here's February and another chance for you to win 1000 POINTS!!! The winner will be chosen RANDOMLY, so don't worry about your artwork, age etc. 3) Write "Done" in the comments here, under this journal. [WINNERS] Giveaway of 100+ Points! Get FeatureWelcome to my first points giveaway! Depending on the success of this giveaway, I will consider making it a monthly event! This giveaway is for a total of 100 and will end on March 5, 2015. Note: Feel free to contribute prizes of any kind! You will be featured here. giveaway! Just for my beloved watchers~! 1. You need to be my watcher. 2. You need to fave this journal. 4. You need to comment here, and insert the link to your journal, containing info of this giveaway. [CLOSED] Sorteo/Raffle 150 puntos/ 150 pointsEditado: este concurso está cerrado. Muchas gracias a todos los que participaron por ayudarme a difundir el caso de Manuel. Los ganadores se elegirán con random.org. Ahora bien, ¿qué tienes que hacer para conseguir los puntos? 1. Añadir esta entrada a tus favoritos o de lo contrario no obtendrás número. Tienes que escribir un comentario en el que enlaces la entrada que tú has escrito.